You are here: Home / 2015 / November / 04 / Well, this is outrageous! “Eminent Men” by W. Warman who does not have a Wikipedia page! In fact, according to the World Wide Web, he barely exists. But he did paint “Eminent Women” on the occasion of the twentieth anniversary of Queen Victoria’s accession to the throne (1857). The queen is naturally in the center. 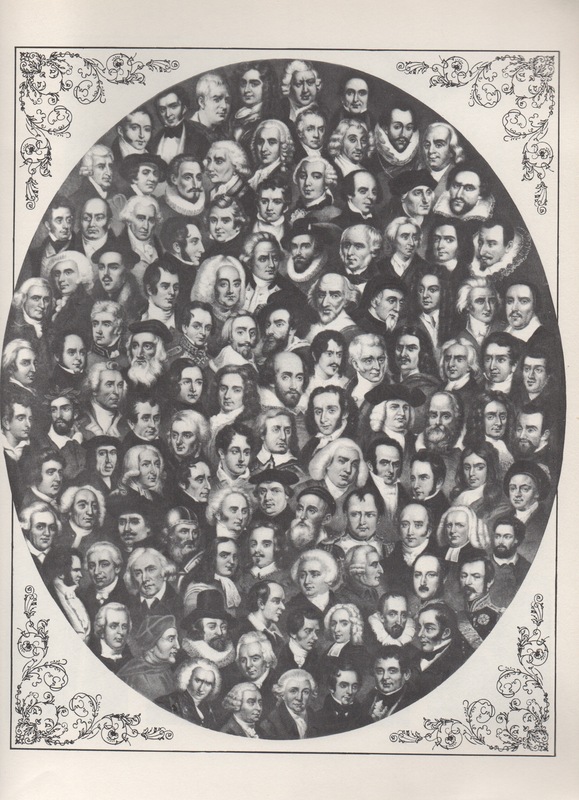 This is the companion piece, “Eminent Men.” Shakespeare is in the center. Fine. Other eminent men radiate out from Shakespeare apparently placed according to their respective eminences. Bacon is #72. Oliver Cromwell is #4 and our very own Francis Bacon is #72!?! No wonder I can’t find anything much about W. Warman.